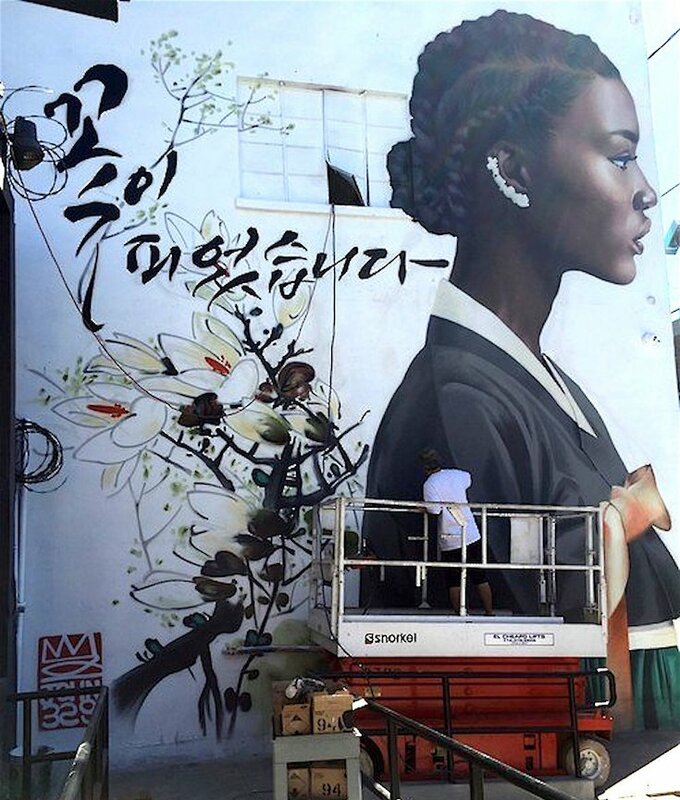 Black Women in traditional Korean ‘Hanbok’ graffiti art works are absolutely beautiful Korean graffiti artist Chris Chanyang Shim has received a lot of attention and praise for his graffiti art featuring an African-American women wearing Korean traditional hanbok. Painting his latest graffiti mural in San Francisco, California, Chris Chanyang Shim has traveled the world decorating walls with his art. While he’s been known for his painting of popular African American icons such as Tupac Shakur and President Obama, he’s received viral attention in Korea for bridging his experiences with both the Korean and African-American communities. South Korea is a sovereign state in East Asia, constituting the southern part of the Korean Peninsula. Officially, its territory consists of the whole Korean Peninsula and its adjacent islands, which are largely mountainous. South Koreans lead a distinctive urban lifestyle, as half of them live in high-rises concentrated in the Seoul Capital Area with 25 million residents. The capital Seoul is the world’s sixth leading global city with the fifth largest economy and is the seventh most sustainable city in the world. (Wikipedia).